Hey there. It’s once in a blue moon that I have a guest post. Like, once in 695 posts. (See Jennifer Schneider’s review of FOOD: Transforming the American Table 1950-2000.) But as I close in on number 700, it’s time again. I am so pleased to be collaborating with Elaine of Hawk Wakawaka Wine Reviews. We’ve started a little exchange of wine (2 bottles) between us and then we’re going to get together via Skype to taste, talk, and report back. What follows are Elaine’s thoughts regarding our inaugural voyage. I sent her two bottles of Washington State wine (Whidbey Island Winery‘s 2012 Puget Sound Siegerrebe and 2011 Yakima Valley Lemberger, which they were kind enough to send as samples) and I got a Varner Chardonnay (2011 Santa Cruz Mountains Spring Ridge Vineyard Amphitheater Block) and a Wind Gap Syrah (2012 Sonoma Coast Majik Vineyard). @jamesonfink @MsKelmore I use to raise Sulcata Toirtoises. Love those things. Such characters. It’s August 2012 the first time I meet Jameson Fink. Out of the blue, there I am pouring obscure Ribolla Giallas from Italy and California for one of the Best Blog of the Year 2012 finalists, Mister Jameson Fink. Immediately, I was struck by his deep comfort with wine. Jameson Fink and I have stayed friends. It’s one of the gifts of the blogging world. There are wonderful people everywhere, and reading them online the ones you share insights with float to the top. So here it is. Jameson Fink and I are friends. Best of all? He likes collaboration. This series you’re currently reading the start of was his idea — let us two get together and find a way to write about wine, together. 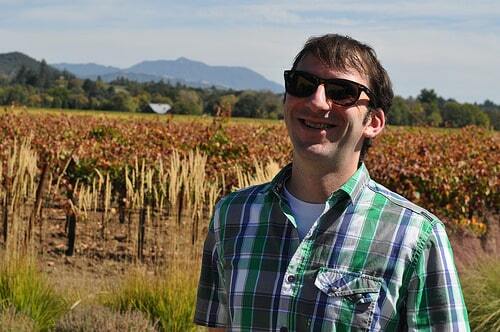 We were able to do some joint wine tours in 2013, and have some more planned for this year. But first, we decided to introduce each other to a couple of the special wines of our respective states. With that in mind, we agreed–He’d pick two from Washington. I’d pick two from California. Then, via Skype we’d taste the four wines together and talk about them. After, we’d each do a write-up for the others site. So, here we are. Here’s the truth. The Whidbey Island Winery wines were a fantastic departure from what I’ve gotten used to drinking in California wine. Both offered nicely delivered focus on fun. The Siegerrebe white, grown on Whidbey Island itself, celebrates the aromatic exuberance possible with German grapes grown in cool climate. With the maritime influence surrounding its vineyard, the wine can’t help but lift a blend of white flowers, white peach, and lychee — all white fruit and flower, in other words — from the glass and long through the mouth. The freshness of this wine overwhelms. Washington wine’s reputation rises from the Eastern side of the state, even with fruit growing from other regions. Jameson’s pick in the Siegerrebe proved a nice contrast from the typical. 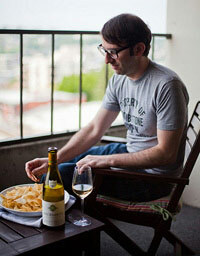 Hit this wine either rooftop in early summer with friends and a bunch of laughs, or alongside Thai food. It has just enough sweetness to calm spicy food. 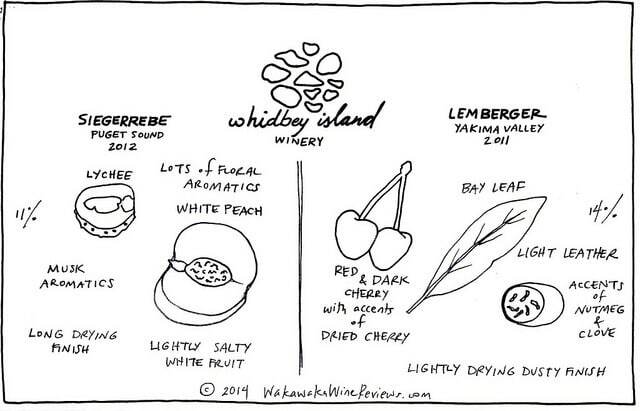 Moving back to the Eastern side of the state, Whidbey Island Winery also produces Lemberger red, an Austrian grape also known as Blaufrankisch. Incredibly, the grape was one of the first more planted varieties of the early Washington wine industry. In that sense, it can be considered a heritage variety for the state, but its acreage has severally dwindled. Whidbey Island’s 2011 Lemberger offers lovely mixed cherry and bay leaf elements coupled with the baking spice accents of oak. It’s a lovely wine, but I have to admit I’d love to see the fruit with less apparent oak. The fruit here seems to carry an innate spice and mineral line that, if I’m right, would give its own complexity to the light-side-of-medium grape. Lemberger can offer a beautiful sense of freshness that reducing the oak would allow. In deciding what California wines to showcase, I wanted to consider what the state does well. So, I selected two wines that both carry that incredibly flavor presence possible in the state, married with the juicy length given by cooler sites. The thing about California is that everywhere in the state has ample sun exposure. It’s UV that brings flavor development whether you have actual temperature heat or not. Put that UV exposure alongside cooler temperature zones and you get a brilliant marriage of broad flavors and a juicy frame. 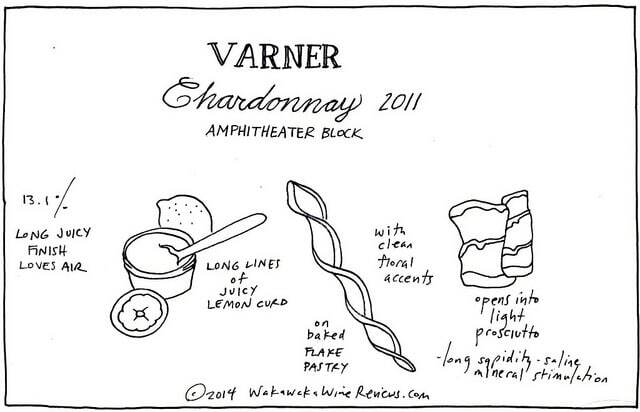 Varner Chardonnay gives just that — a ton of palate presence on a lithe frame. Their Amphitheater Block, which I selected for Jameson, in particular is so juicy, with creamy pert citrus elements stretching into palate stimulting rocky, saline crunch. It’s a personal favorite. From the Portola Valley region of the Santa Cruz Mountains, Varner Chardonnay exemplifies how special that area is for the white grape. 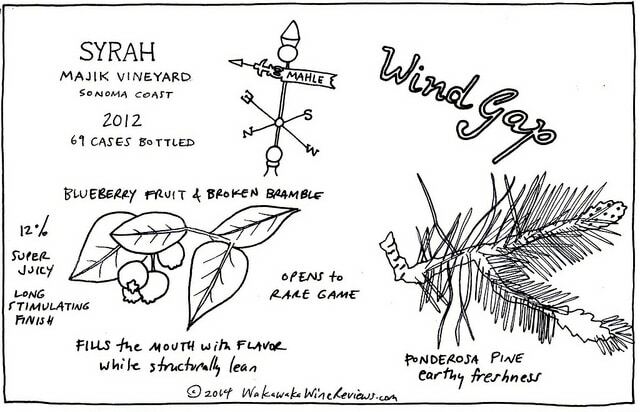 The Wind Gap Majik Vineyard Syrah doesn’t get released until Fall 2014. To secure a bottle each of this ultra low production wine, then, was really special. Pax Mahle of Wind Gap works with true Sonoma Coast vineyards, sourcing Syrah from sites mere miles from the cold influence of the Pacific Ocean. The area offer incredible tautness to the wine, with a cool fruit-spice focus on the flavors. The Majik Vineyard is especially cold bringing an ultra lifted aromatic element to the wine. The Majik Syrah is all about aromatic floral lift, and juicy length. I’m excited to say that Jameson and I are going to keep collaborating. Our next trade will be focused specifically on rosé. We’ll each select one still, one sparkling from anywhere in the world to show off to each other. A perfect way to enjoy summer. Thanks Elaine, and BRING ON THE ROSÉ!! !